Latin Waves host Sylvia Richardson speaks to Silvia Federici about her latest book: Revolution at Point Zero: Housework, Reproduction, and Feminist Struggle. The struggle to make visible how the Capitalist system depends on the unwaged reproductive labour of women. How the revolution must include both the liberation of men and women from exploitation. She speaks of the challenges, victories and alternatives. 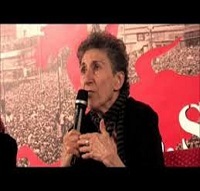 Silvia Federici is a feminist writer, teacher, and militant. In 1972, she was cofounder of the International Feminist Collective, which launched the Wages for Housework campaign internationally. This entry was posted in Uncategorized and tagged another world is possible, author, be the media, community, dispatches, Economics, Feminist struggle, Flesh Mapping, Global Economic Crisis, global news, how to listen, international, internet, interviews, itunes, Latin America, latin waves media, media, media democracy, membership, movements, passion, Peace, podcaster search engine, Podcasting, political, politics, Radical, radio, Revolution at Point Zero, Silvia Federicic, social change, sound, Stuart Richardson, Sylvia Richardson, syndicated, twitter, youtube. Bookmark the permalink.